Last year the Australian Bureau of Statistics (ABS) invited the community, through its public submission process, to inform them of any recommendations for changes to the 2021 Census. The ABS recognised that there had been no changes to topics since 2006 so there was pent-up high demand for additional topics for inclusion. The ABS also recognised that they have to balance the need for additional topics and the statistical time series of past/future results, the respondent burden to complete the information requested on the census night and the limited space on the paper form being mailed to every household. ADHD Australia followed the ABS Consultation Process and its assessment criteria for submissions and submitted its recommendations for changes and additions to the ABS, for its Census 2021 project, to enable better statistical information to be gathered on the incidence and impact Attention Deficit Hyperactivity Disorder (ADHD) has on the Australian community, especially the ADHD community. the likelihood of higher education achievements. All of the community submissions were reviewed by the ABS and during November ADHD Australia participated in a presentation by the ABS on the topics which made the review stage. During 2018/2019 the ABS will undertake their topic development, testing and assessment of any new and revised topics. The topics ADHD Australia are most interested in is the ‘Chronic health conditions’ as this, if including ADHD/Learning Disabilities, can be cross referenced with other census topics (including 7 and 8 above) to provide some relevant incidence and prevalence statistical evidence for use. The ABS is keen to ensure that “the jargon, the medical term [they] give to a condition is expressed to a way that someone sitting at home in three years’ time can say that they have that condition and tick the box” and the ABS is also thinking “about the sensitivity of answering a question” so people will feel at ease when answering. The ABS will make recommendations to the Australian Government in mid-2019 on whether the Census requires new topics, changes to existing topics or the removal of existing topics. It will be the Australian Government which will make the final assessment of what topics will remain, be changed or be included into the Census. During 2020 the final Census questions will be published for the Census 2021 and also will be made available to the community. 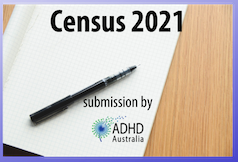 ADHD Australia will remain involved with the Census 2021 project and will feed back to the ADHD community any further information which comes to light during 2019 and 2020.